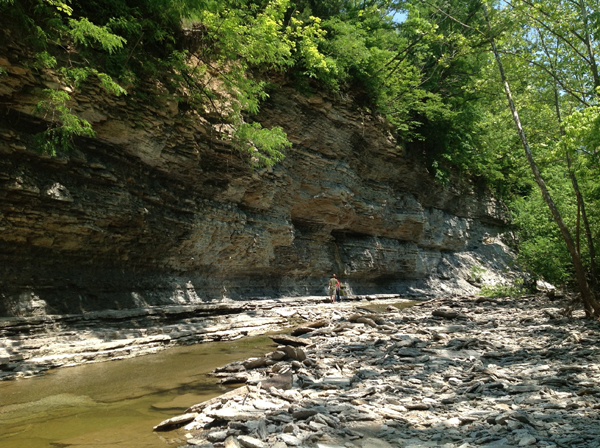 This cliff in Morrow, Ohio, offers clues to the ancient invasive species puzzle. Image: Alycia Stigall. Did you know that North America was part of an ancient continent called Laurentia that sat near the equator and had a tropical climate? Or that the forerunner to the Appalachian Mountains—called the Taconic Mountains—were forced up about 450 million years ago through tectonic plate movement? 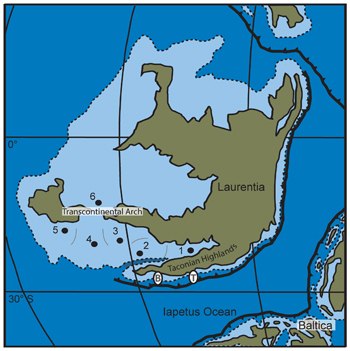 Late Ordovician paleogeography of Laurentia. As the Taconic Mountains rose, cool ocean water rushed into the depression that formed behind the mountains, and a dramatic ecological shift followed, according to a release about an article the journal PLOS ONE. To read the geologic record—such as that exposed in cliffs near Cincinnati—Dr. Alycia Stigall, Associate Professor of Geological Sciences in the College of Arts & Sciences, and David Wright ’12MS, a geology alum, developed a novel approach to understand the relationship between the geologic change (mountain building) and the biotic change (the biodiversity shift). 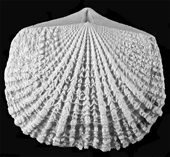 They looked at the evolutionary shift in the articulated brachiopod species in North America. This slab of rock from the Cincinnati region contains fossils of the invasive species under study, as well as other fossils. Image: Alycia Stigall. 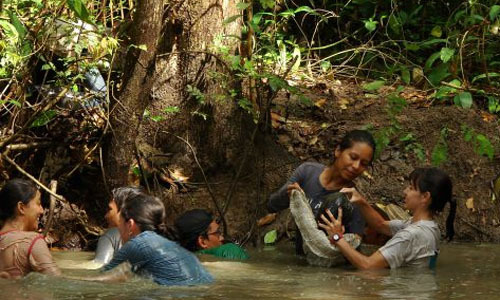 Scientists knew that there was a massive influx of invasive species into this ocean basin during this time period, but didn’t know where the invaders came from or how they got a foothold in the ecosystem, said Dr. Alycia Stigall, an Ohio University associate professor of Geological Sciences who co-authored the paper with former Ohio University graduate student David Wright, now a doctoral student at Ohio State University. Glyptorthis, one of the species of brachiopods studied. Image: David Wright. “The rocks of this time record a major oceanographic shift, pulse of mountain building and a change in evolutionary dynamics coincident with each other,” Stigall said. 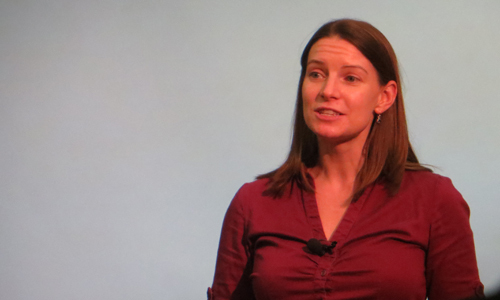 “We are interested in examining the interactions between these factors.”Using the fossils of 53 species of brachiopods that dominated the Laurentian ecosystem, Stigall and Wright created several phylogenies, or trees of reconstructed evolutionary relationships, to examine how individual speciation events occurred. The invaders that proliferated during this time period were species within the groups of animals that inhabited Laurentia, Stigall explained. Within the brachiopods, corals and cephalopods, for example, some species are invasive and some are not. As the geological changes slowly played out over the course of a million years, two patterns of survival emerged, the scientists report. 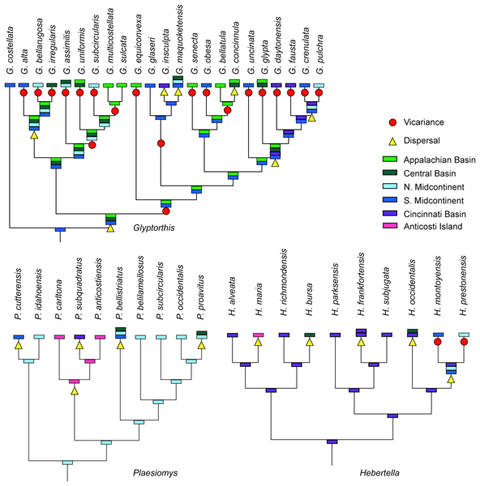 The evolutionary pattern that Stigall and Wright detail in their article is a pattern they also identified during a biodiversity species shift 375 million years ago. Native species begin to evolve into different species more suited to the new habitat. New species invade the habitat. Biodiversity initially increases only until aggressive species dominate the ecosystem. It’s a pattern that’s happening during our modern biodiversity crisis as well, according to Stigall. Funding: This research was supported by NSF EAR-0922067 to ALS and the Schuchert and Dunbar Grants-in-Aid Award from the Yale Peabody Museum, the Dry Dredgers Paul Sanders Award, the Ohio University Geological Sciences Alumni Grant, and the OHIO Center for Ecology and Evolutionary Studies Fellowship to DFW. Read “Rising mountains, cooling oceans prompted spread of invasive species 450 million years ago, study finds” in Ohio University Research News. Read the Eureka! Science News article. Read the PLOS ONE article.